Since the beginning of time man has been trying to observe the patterns of animals whether it was to put food on the table for survival, recreational viewing, or trying to hunt down that 200" buck of a life time. Whitetail buck that slipped away last hunting season. Lets face it, if food for survival is your motive you can't afford to mess up. Especially if you're trying to feed an extended family. Nonetheless, some basic principles would be applied in all situations. So lets begin with some basic questions of what kind of habitat do Whitetails like? Keep in mind that White-tailed deer are highly adaptable species and can thrive in a variety of habitats. The areas that provide the most suitable environment include a mixture of hardwoods, croplands, brush and pasturelands. They prefer an interspersed habitat including meadows, forested woodlots, brushy areas and croplands. Modern day whitetail deer have fewer natural predators and in many areas hunting has become a primary method of managing deer herds. If good habitat exists, a North American whitetail deer can be expected to occupy 300-400 acres. Many factors can influence this range like if one of the 3 necessities a deer needs for survival (food, water source, and cover) become unavailable. The 'Rut' is probably the most important time in a whitetail's life cycle as well as a hunters. This is the period when the females are in estrous and the males turn into gladiators! For hunters this is the optimal time to catch a mature buck which is, shall we say 'under the influence of love', and let their guard down long enough to balance out the playing field in slight favor of the hunter. 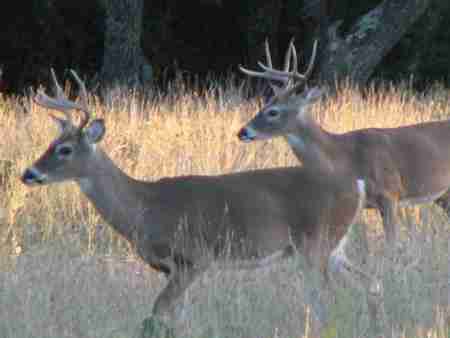 From the first day a buck is born he will be battling for dominance of the females for the rest of his life. Many times you will see young buck fawns not more than 3 weeks old already sizing each other up. They begin playfully but the older they get the more intense it gets. Sometimes bucks fight unfortunately to their death all for the chance to breed a doe. The rut will cause a buck to follow a doe in heat for miles until she either accepts or rejects him in favor of a more dominant buck. As seen in recent past and present, as populations of whitetail increase so does disease and parasites which ultimately cause widespread attrition in whitetail herds. Right now the major disease affecting the Whitetail industry is EHD. What is EHD? Epizootic Hemorrhagic Disease is an infectious, viral disease that has is known to have large scale outbreaks in deer populations in Texas, Oklahoma, Louisiana, and New Mexico. 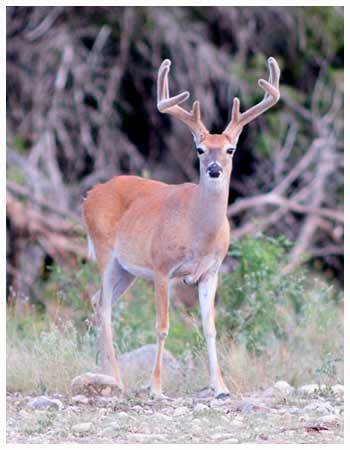 The overwhelming effects of this disease have left everyone asking questions about this relatively new disease affecting whitetail deer in Texas. It is believed that the disease is carried and transmitted by a Culicoides Midge, or biting fly which is most active during summer and fall months. It is something that everyone in the whitetail industry needs to pay close attention to and continue to research and monitor to prevent massive setbacks to the species. If hunters want to bag the 'Ultimate' Whitetail Trophy buck they will need to do there homework regarding habitat, range area, and peak rut times. Knowing when a bucks defense system is at its lowest will give the hunter the greatest opportunity to harvest the trophy of a lifetime. It all goes back to what you put in you will surely get back. Good luck and Happy Hunting!